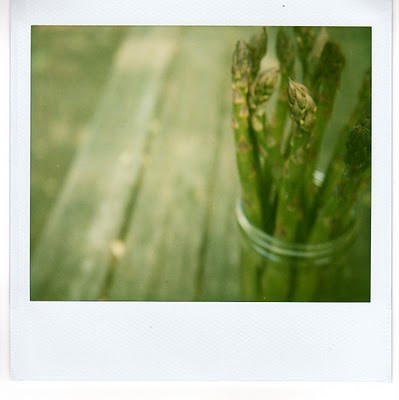 Every Saturday in Orleans, the asparagus at Ron Backer's stand is the first thing to go. Right now, he has only Jersey Knight spears—from a patch of hybrids he planted back in 1998. The plants are sterile, meaning that they are all male and produce thicker, taller spears. Two years ago, though, when Backer realized that the local food movement was here to stay and his supply started having a hard time keeping up with demand, he planted another patch. This time, he choose a more traditional asparagus called Mary Washington. Mary is known for her purple-tinged spears, although she won't produce as many big, fat ones. (Traditional asparagus has half male and half female plants, and because the female plants have to put energy into reproduction and going to seed, they produce thinner, smaller spears.) But she will make seedlings, and he can sell these at the market, so he figured it was a pretty fair trade. The Mary Washington patch is up and producing, but before he can pick it'll still be another year. The thing about asparagus is that you have to wait three years before cutting any spears. As Backer explains it, asparagus grows from the stem, which is essentially a grass stem. The bud matures and grows four to six feet high and then turns into a fern. That fern acts like a photo cell: it captures carbon dioxide and water in the presences of sunlight and turns them into sugar. The sugar compounds into starch and gets sent down to the roots for storage. If you cut the spears before they turn into ferns those first few years, they aren't able to store any energy up. They need at least a few years storage to get off the ground; otherwise, there will never be fat spears. His recommendation is to blanch the asparagus, cut some toast, soft-poach an egg, mince some garlic, and finely chop a handful of basil. Then he likes to rub the toast with the garlic, layer the basil and then the egg on top, and finally, drape the spears across. Then he drizzles the whole pile with a bit of nice olive oil, sprinkles it with a few cracks of salt and pepper, and digs in. After I got home from the market the other day with a bundle of Jersey Knights, I decided to follow the plan. Only I didn't, exactly. Instead of rubbing the toast with minced garlic, I made a garlic-anchovy butter that I'd been eying for a while from the April issue of Martha Stewart Living. I fried my egg instead of poaching it, made sure the yolk was nice and runny, and after I'd spread the toast with plenty of briny butter, layered the egg on top. Then I poached the asparagus until just al dente, sprinkled the whole thing with salt and pepper, and sat took a bite. The egg ran all over the plate, the garlic-anchovy butter melted into the bread, and the asparagus sopped it all up. All in all, I'd say it was a pretty good plan. So good, in fact, that if you'll excuse me, I think I'll go make it again. For the bread in this recipe I used a loaf of sourdough from Pain d'Avignon bakery in Hyannis. You could probably use any rustic loaf; the important thing about this recipe is to make sure the asparagus is fresh and the egg is under-cooked, so that the yolk oozes out all over the plate. In a food processor, combine the butter, garlic, and anchovy fillets. Pulse until smooth. Cover the bottom of a large sauté pan with 1/2-inch of water and bring it to a boil. Lay the asparagus into the water and cover the pan. Cook for 2-3 minutes, or until the asparagus turns bright green and is just al dente. Turn the heat off, pour the water out, cut the asparagus spears in half, and set aside. Turn the heat to high under another large sauté pan. When the pan is hot add a splash of oil; once the oil is hot, crack the eggs into the pan. While they fry, toast the bread and get out four plates. Flip the eggs and cook them over-easy; then turn the heat off. Put a piece of toast on each plate and spread the toast generously with garlic-anchovy butter. 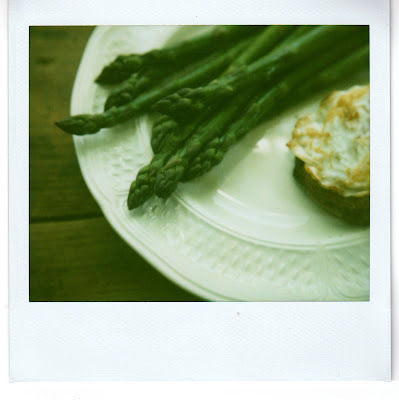 Put an egg on each piece of toast and arrange a layer of asparagus spears on top. Sprinkle with a few cracks of salt and pepper, and serve hot. P.S. My Minolta is back! She arrived last week in excellent condition, and as you can see, I'm happy to have her home. You are a good teacher. I knew when starting an asparagus bed you could not cut any spears for three years.But I did not know why.Nor did I know there were male and female spears.Thanks for enlightening me.xoxobiee. Where did you have an asparagus patch? I had no idea you were such a gardener.